IMPLY and INFER are easy to confuse – especially if you’re new to the English language. But these two words are actually opposites. 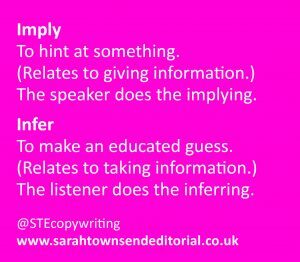 Here’s a simple tip to remember the difference between IMPLY and INFER. IMPLY is a verb that means to hint at something. IMPLYING is done by the speaker. It relates to giving information. INFER is a verb that means to make an educated guess from the information presented to you. INFERRING is done by the listener. It relates to taking information. For more spelling and writing tips, check out my Facebook page or follow me on Twitter. Or tweet me your own favourite spelling tips that help you remember those tricksy #confusables. Imply vs infer: do you know the difference?